Elizabeth Cemborain was born in Caracas, Venezuela in 1959, where she lives and works. You can watch a four-minute film as she introduced several of her digital landscapes at Encounters Art Space in May 2017. Click on the link below. Elizabeth graduated as an Architect from the College of Architecture and Urbanism, Central University of Venezuela in 1982 and was the leading student of her year. She worked as an architect for nine years and then studied at the School of Visual Arts Cristobal Rojas, receiving a degree in Pure Art, Drawing and Painting in 1994. She has participated in group shows in galleries, museums, cultural centres and art fairs in Spain, United States and Venezuela. She has had solo shows in Caracas and Maracaibo. Her work can be found in private collections in Spain, United States and Venezuela: she maintains an active presence in printed and digital publications. She says: “I am interested in urban landscapes, through the language generated by digital media. 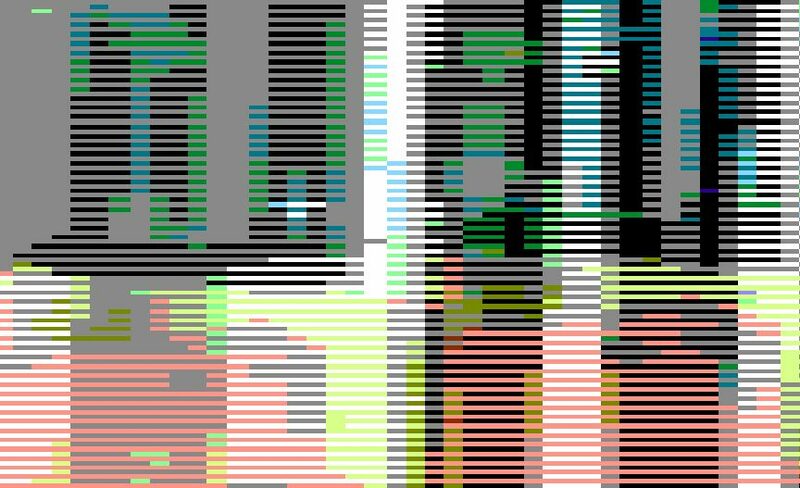 While I transit cities, I make video recordings from which I extract several individual frames. After enlarging these interlaced frames, I generate a synthetic landscape, with rhythms and colours typical to each urban experience. I present my research through printings and experimental videos with an aesthetic that dialogues with Latino American Geometric Abstraction. I have made various series, each from a different city, including Caracas, Maracaibo, Boston, New York and now Miami”. Elizabeth Cemborain showed her synthetic landscapes in Encounters in 2017 that have been produced after working with interlaced still frames from video recordings taken while transiting Caracas, Venezuela. The series was generated after driving to the centre of the city, looking for an urban experience. Caracas’ Central Park is a huge concrete complex, with two high office towers and some residential units. It is a special architectural site and my works capture a new perspective on this extraordinary place.